There are haters everywhere, or at least that’s how the song goes. Lord knows I have a bunch. That’s why Jake Banks created Los Angeles startup Hater. It’s the world’s first social network surrounded by things people hate. The social network is alive and growing at a very quick rate. People are finding lots of commonalities over the things they hate. It can be anything from hating the New York Yankees to hating pickles on a Big Mac. It can even be hating your ex-girlfriend. But, co-founder and Chief Marketing Officer Andrew Batey says “It’s not about bullying”. Hater App works on your mobile device. Download it from the app store and you can immediately start identifying the things you hate and identifying with the people who hate similar things. If a person becomes the subject of too much hate, or things get inappropriate (to a degree) they will get filtered out. To date there’s been nothing available like Hater, and it’s caught the eye of celebrities like Teyana Taylor, Wiz Khalifa and Fat Joe who will feature the app in his next show. “Fat Joe’s people found out about Hater and reached out to us” Batey explained to nibletz.com at TechCrunch Disrupt NY. Hate isn’t always used as a bad thing though. Batey explains that there are celebrities that are getting together over issues like global warming and getting users to say why they hate global warming. “Users may say things like I hate global warming because I can’t breathe” Batey said. It’s a great awareness tool and it’s blowing up. 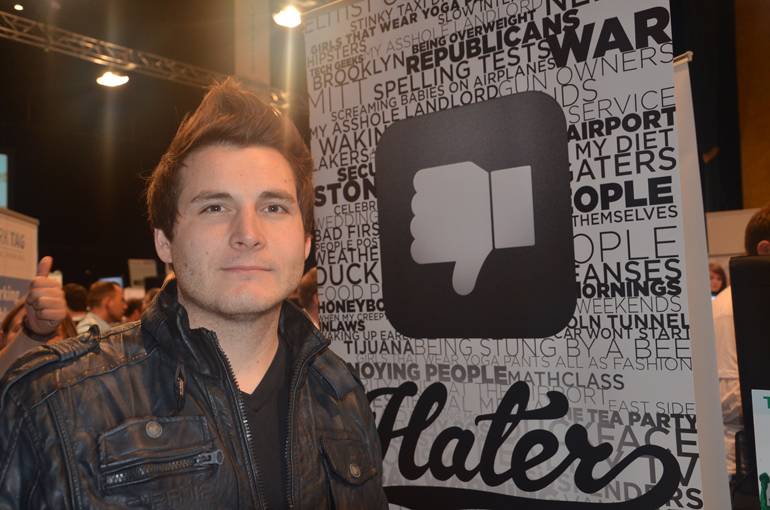 Hater launched at SXSW and since then Batey and Banks have been hard at work promoting their startup globally. They recently did New York Tech Day, TNW in Amsterdam and now TechCrunch Disrupt 2013. “You don’t always have to like something, and the option to hate or dislike has been missing out there. Everyone has something they hate; now you can and it’s better than therapy.” Banks said in a statement. Mashable recently featured Hater in “8 standout apps from March” which is a particularly big honor considering how many apps were released at SXSW which fell during that month. They’ve also been featured on Wall Street Journal live. People are quickly beginning to see that Hater app is a lot deeper than you may think. Check out our interview with Batey below. More from TechCrunch Disrupt here at nibletz.